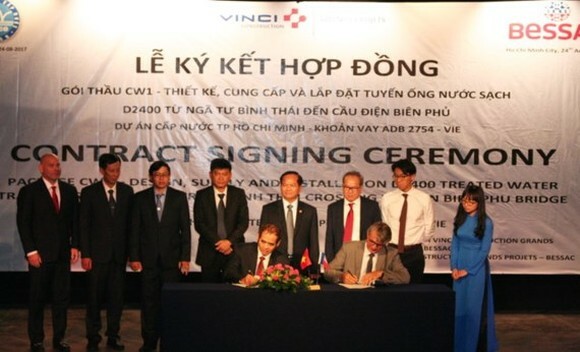 The Saigon Water Corporation (SAWACO) and France’s Vinci Construction Grands Projects - Bessac CW1 yesterday signed an agreement to install water supply pipe. The new water supply pipe will be laid in the length of 10 kilometers from Binh Thai Crossroad to Dien Bien Phu Bridge through districts 1, 3, Binh Thanh and Phu Nhuan. Contract is worth around $69.22 million. The work will be carried out in 1,280 days. This is one of major water pipe in the city’s water supply plan till 2025 which the Prime Minister has approved. It is also the biggest item of the project to expand water supply and improve the water supply network funded by the Asian Development Bank (ADB which valued at $154 million; of these, ADB provided $138 million loans.